This morning, the New York Times is characterizing the surveillance program as “collecting business communications records.” The Times appears to base that assumption on the fact that the company that has been secretly releasing the phone records is Verizon Business Network Services. But according to BusinessWeek, that division of Verizon “serves residential customers, businesses, and communications wholesalers, as well as federal, state, and local government entities.” Ironically, it also provides security products to its customers. If one objective of the government was to learn which federal government workers were leaking information to journalists, this would appear to provide those records for calls made using Verizon. It is not yet known if other telecommunication companies were involved. The Top Secret court order was issued by Judge Roger Vinson on April 25 of this year and is set to expire on July 19, 2013 if not renewed. Vinson serves on the Foreign Intelligence Surveillance Court (FISA) which has authority in these matters under the U.S.A. Patriot Act. The court order was requested by the FBI but the order instructs Verizon to turn over the records to the National Security Agency (NSA). The ACLU said the court order was made possible by the U.S.A. Patriot Act’s Section 215, a provision that authorizes the government to seek secret court orders for the production of “any tangible thing” relevant to a foreign-intelligence or terrorism investigation. Under the law, telecommunications companies are prohibited from disclosing that they gave the government their customers’ records. Another public interest law firm, the Partnership for Civil Justice Fund (PCJF), launched a program in 2012 to track the government’s spiraling surveillance of innocent American citizens using Automatic License Plate Recognition (ALPR) cameras, also known as tag readers. According to PCJF, the Department of Homeland Security has created customized software to integrate the surveillance data obtained through all the different vendor systems that are on the market and used by different localities. The federal government has a massive data storage center for tag reader information located in Northern Virginia. With a plate and a cross-reference to other databases (like the Department of Motor Vehicles, credit card companies and phone records) a full profile of the individual can easily be created. The fusion of license plate reader data with commercial databases and intelligence databases gives the government virtually unlimited knowledge of an individual’s activities and associations. 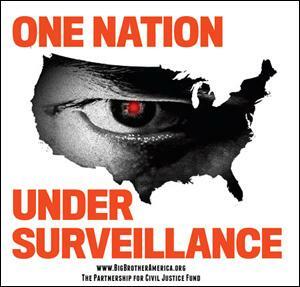 PCJF has created a national campaign, “One Nation Under Surveillance,” with a proactive website www.BigBrotherAmerica.org.